Born on the Antillen island Martinique and for many years living in Paris, the Gibson Brothers started their career in 1976. 1976 Their first single Come To America became a European success and no. 1 in France and Italy. 1977 They composed Non Stop Dance which became a no. 1 hit in Belgium, Holland and Northern Europe with 1 million copies sold. Enough for concerts and touring through whole Europe. 1980 Mariana entered the Top 20 in Spain, Germany and England. Their biggest hit Que Sera Mi Vida was released and sold over 5 million copies. 1983 Again a golden record in France for more than 500,000 copies sold for My Heart’s Beating Wild (Tic Tac Tic Tac) . 1985 Slowly the brothers started with record production. The first result was T’as Look Coco with Laroche Valmont. 1987 Group of the Year in England after the release of their album Emily . 1990 The single Let’s All Dance with David Christie became a hit in Belgium. 1996 Again a hit in Belgium with their newest single Fire . 1997 Ten years after their last album Emily a follow-up with a new album called Move On Up . 2005 A new album, Blue Island , produced by Axel Breitung, was released in Germany. 2007 A new single Big Bamboo was mixed. The sound is brand new and really surprising. 2010 After about 15 years Alex Gibson, original member of the Gibson Brothers, came back from Martinique to France and joined the group again. 2011 January – release from Everybody Baila . A single recorded by the Belgian singer “Afi” together with the Gibson Brothers. 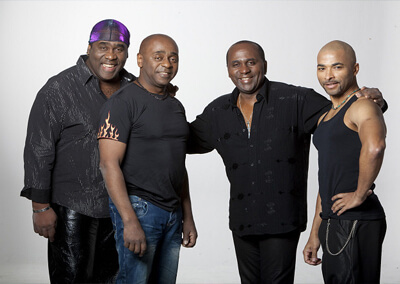 After touring all over the world, After thousands of successful shows, After selling millions of copies of various hits and albums, – THE GIBSON BROTHERS – 35 YEARS CELEBRATION ! After 35 successful years, everybody still recognizes the typical Disco/Salsa stylefrom the Gibson Brothers. Party Time still guaranteed !